Once upon a time, I was a princess — for a day. Three hours, if you want to be exact. But still, how many people can even say that? Hey it’s Princess Allison — I mean Aurora. 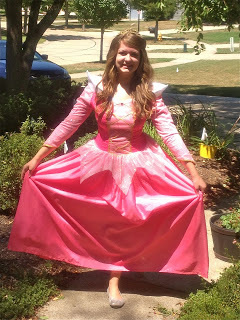 This past Sunday, I was Princess Aurora (better known as Sleeping Beauty), for a six-year-old’s birthday party. Little Princess Hannah usually has a live character sent “all the way from Disney World” to her extravagant birthday parties. Last year, my friend Brittany was Snow White so this year, when Hannah wanted a different princess, I was lucky enough to get the job. (I say that in all seriousness, because as you’ll see, this was a great fairytale). My day as a princess began when I put on my pink, Aurora dress and gold tiara in my castle (home) and journeyed (in my Honda Accord) to the birthday girl’s house, which is in a wealthy neighborhood in my town. I parked around the block, where I met my horse and carriage. Yep, that’s right. I only wish this princess was allowed to take pictures because the things I saw today were straight out of a fairytale. Luckily I found a picture of Ribbon, the horse pulling my carriage, online. When she isn’t giving rides to princesses, Ribbon chariots “peons” in the “provincial,” neighboring town of Chagrin Falls. But today, with blue streaks in her mane and tail, Ribbon was ready to give rides to pint-sized royalty. While Hannah and her guests waited in the front yard, Ribbon (guided by the carriage driver) and I trotted down the street to Hannah’s castle (no stretch in the details there). Hannah’s hands flew up to her mouth and her eyes widened in shock as she registered who I was. Her blonde curls bounced up and down as she waved vigorously in her matching Sleeping Beauty dress. The carriage pulled up the circular driveway in front of the house and stopped. “Happy Birthday Princess Hannah!” I said while giving my best princess wave. Hannah’s mother then decided it was time for all of the guests to go on carriage rides. As I posed for pictures, kids shyly climbed up, seemingly nervous in the presence of a princess. I took twelve carriage rides in all, each of which consisted of pulling out of the driveway, riding around a cul de sac and pulling back up the driveway. Each of the twenty kids at the party got multiple turns, even though they started to admit they were “bored” after a while. Luckily for them, Hannah’s mom booked nearly every entertainer in the city to keep them occupied. After the carriage rides, I followed Hannah into her backyard, where a feast fit for a king was set up under a pink and white tent. In a somewhat Disney World-like fashion, I ate lunch with the kids and sat next to Princess Hannah (who was seated appropriately at the head of a plastic, folding table). The kids had a wide selection to choose from — macaroni and cheese, burgers, hot dogs, chicken kabobs, ribs, cheesy potatoes, veggies and fruit. During lunch Hannah decided that she was too hot in her princess dress and took it off in front of everyone (there are still some things this young Princess has to learn). She changed into her Disney princess bathing suit and her friends followed her to a giant inflatable water slide that emptied into a little pool. Besides getting airbrush tattoos and jumping on a trampoline, the kids had their own private magic show. But these weren’t just any magicians — this was “Shizzle Dizzle,” composed of Mystical Matthew and the Great Nancini, a mother-son team. Yep, it’s as awkward as it sounds. So awkward that even the kids started leaving slowly and running back to the inflatable slide to make their own disappearing acts. After sitting through the 45-minute magic show and more than 20 minutes of uncomfortable, sarcastic comments from “Mystical Matthew” about how no one was watching and the kids were in the pool, it was finally over. After, the kids got in line to get balloon animals from none other than Mystical Matthew’s dad. One little boy got a bumblebee and kept making it sting me. So that was nice. Then it was time for cake, the elaborate “Cake Boss” looking princess castle that no picture I googled could even resemble (this one is close though). I stood next to Hannah as she blew out her candles. It was in this time that the moment that made everything worth it happened. For as “spoiled” as she may be, Hannah is a sweet little girl. Sure, she has everything, but she never complained when her little friends stuck their faces near the candles to blow them out or ate candy off of her plate when they could’ve just as easily reached into bowls on the table. She said “thank you for coming” to everyone who arrived and spent time with all of the kids who were there. Our goodbye was quick, as Hannah had to leave the pool to say goodbye and was anxious to get back. I apologized for leaving, saying I had to go take a nap before I could go back to Disney World. We shared a wet hug, then Hannah scampered back to the pool in her Disney princess bathing suit. I had to return the dress before I left, so I slunk out to my car and changed, then snuck in to return the dress to Hannah’s mom. She thanked me again for coming, but I honestly felt as though it was me who should be thanking her. I had a great time holding hands with “little princesses,” listening to their random stories and making up tales of my own. And as one of the featured entertainers, I like to think I was part of the reason why Hannah had such a great birthday. Sure mother-son magicians are “mystical,” and an inflatable pool is great on an 82 degree day, but I hope that one day “grown up” Hannah remembers Sleeping Beauty’s advice — to be nice and caring to others, even if the goodness comes after a much deserved naptime. I’m a tiger. Missouri tiger that is, so when I first saw the Penn State Nittany lion, I teased my brother that it must be a girl, because this “lion” didn’t have a mane. He soon corrected me, saying “nice try, “ but that the Nittany lion was like a mountain lion, which also doesn’t have a mane. Shows how much I really know about big cats. But what I do know that Penn State has been getting a lot of press lately. (After all, I’m not living under a rock like the aforementioned big cats do). My brother is going to be a freshman at Penn State in about a month. And now, I know what you’re thinking. “What?” “How could he pick Penn State?” or “Why?” Believe me, I’ve been asked all of them. And he has had to face countless “Sandusky” jokes and many rude comments from his outraged friends, who pay far more attention to sports than my friends do. But Penn State is a good school. A great school actually. With 96, 519 students enrolled on all campuses worldwide last year, Penn State has more than 560,000 living alumni worldwide. That’s a lot of lions. And for my brother, a business major, it’s a great place to get an education. According to the 2012 U.S. News and World report, Penn State is the 13th top public university and the 20th best undergraduate business program. Now I’ll be the first to admit that what happened at Penn State is shocking. It’s inexcusable and it’s horrifying. But after a tragedy occurs, the community that’s left behind must take steps to try to repair and rebuild. The coaches affiliated with the scandal have been fired. The locker rooms are being renovated to try to gut out the ghostly reminders that remain. And the board is accepting responsibility for what happened. No one is denying that it was awful. Now, everyone is trying to make things better from here on out. Yet there’s an outcry for the football program to be given “the death penalty.” Rick Reilly recently published a column calling for such a fate for the program. In it, he says what a “fool,” “tool,” “stooge,” “sap” and “chump” he was for believing that Joe Paterno was a legacy. His column discusses his intense disbelief that he defended someone who lied to a grand jury and let such despicable acts continue for years on end. But really, Rick? The death penalty for Penn State football? Though you arguably know far more about sports than I do, I think that’s a little extreme. After all, it’s punishing all the lions who are left. The hundreds of thousands of alumni who carry on the Penn State legacy. The players who had no idea what was occurring, yet continue to proudly wear blue and white. And the students, who are at Penn State to get a reputable education and celebrate their school spirit. You’d think Rick, someone who writes about turning to sports in times of heartbreak, would see that this is a new chance. A chance for the Penn State community to heal their hearts and rally around something they can be proud of. I’m sure you can only imagine what the energy will be like on the first football game day. The cheers, the excitement, the sea of blue and white in the 106,572 seat Beaver Stadium. The tears, both happy and sad. Because the reminders of tragedy will be there, but also because the brink of a new beginning will be there too. I admittedly don’t know much about sports. But I do know a lot about the anxiety that comes before you enter your freshman year of college. The nerves, the excitement and the thrill at belonging to a new community. I know that when you get to college, things are scary and exciting. And even for someone who isn’t the biggest sports fanatic, I also know that the first football game is a game-changing moment. It’s when you, as a lion, or tiger (or bear) or whatever you are, feel a part of something bigger than yourself. A part of this community that is your college and a part of the next phase in your life. Why should these new Penn State freshmen be deprived of that feeling? I couldn’t be more proud that my brother is going to Penn State. He’s going to experience the positive change that comes with restructure. He’s going to be a part of making Penn State stronger than it ever was before. Penn State’s motto is “making life better.” As corny as it sounds, I have no doubt that my brother and the rest of his classmates will do just that (even if they do have a lame lion mascot without a mane).